Blog Tour for Sinking | Love2ReadLove2Write Publishing. If you are a YA fan, love historical fiction, are an avid romance reader, relish a mystery, and enjoy fantasy ~ Sinking is the book to dive into and swim between the pages. Debut author Sarah Armstrong Garner’s first book in a trilogy releases on February 23 and promises to transport you to 18th century Ireland for a memorable adventure. Joycelyn, ship captain Aiden Boyd, and fleet owner Thomas Corwin did not choose the circumstances they share, nor do they truly have control of their individual destinies whether on land or in the sea. The two men are irresistibly drawn to Joceyln’s inner and outer beauty and a struggle for her love ensues. The young woman with amnesia is not sure who to trust after she washes up on the Irish shore after a terrible storm. Intrigue sets the course for her in the manor of an elderly woman who discovers and takes her in, then barters with her life. Mystery surrounds Jocelyn and she is determined to search for her identity even if it means risking all by sailing to India and China with both Aiden and Thomas on board along with a superstitious crew. The sea calls and a hauntingly familiar voice begins speaking to her. The waves respond to her moods. She begins to wonder what world she belongs to as longing stirs her heart for the handsome captain, and to become one with the ocean at the same time. Is love as dangerous as the mighty depths and the secrets that lie below? Author Sarah Armstrong-Garner not only weaves YA fantasy, she writes stage and screen plays, is a professional photographer, and was a producer and stage crew for local TSPN television station. Sarah at TSPN TV Station on the set of ~ Authors, Writers, Books & Beyond Show. Kathy ~ How do you divide your time between your Ya novel writing, the screen/stage play genres, your family and other work? Sarah ~ Novels take a lot more time to write so most of the time I’m in the middle of a book when writing a stage or screen play. I have to put the novel aside for a while until I finish the other. I get a lot less sleep. During the day I’m a full time mom with very little time to write, so I do most of my writing at night. I find I’m more creative during those uninterrupted hours. Kathy ~ What writer conferences have you squeezed in that are helpful through the continuing process of your writing journey? Sarah ~ There have been a few that have helped me a lot ~ Gold Rush Writers, Squaw Valley Community of Writers, and The Great American Pitch Festival. Each one offered new information to help me develop my craft. Mingling with like-minded peers was priceless. Kathy ~ Let’s talk about the process of writing a book. I know when you came to Amador Fiction Writer Critique Group in 2011 it was your first time with a critique group. The bi-weekly meetings help keep a writer accountable, to keep writing. And you did this after your first child, pregnant with your second, and again with your third. That has to give other aspiring writers serious encouragement! Sarah and Elijah! After the baby arrived ~ a summer of one-on-one critique time. Kathy ~ You transitioned from a larger beginning critique group to more intimate small group as your story changed, your characters grew in depth, and some of those “darlings” left. Then the rewrites, rewrites, rewrites. Did that help? Sarah ~ Yes, seriously! I was able to develop relationships within that inner circle which grew a deep trust. The feedback more in tune to encourage me to stay true to my voice. Kathy ~ I can’t agree more. I think respect for voice is of great value. And how blessed to have John who used to live and work in Ireland a part of that small group. He had great insights to the physicality of the land and sea of the then location in your story. Sarah ~ Definitely. Then he moved to Sweden! Kathy ~ Our group builds each other in discipline and challenges risk, to take leaps of faith, but to weigh what is beneficial and what may not yet be. We delve in self, indie and traditional publishing, also hybrid, and do a lot of networking too. Sarah ~ I wouldn’t be here without the amazing Amador writers. They helped me get my D***y first draft out and grow as a writer. Kathy ~ Sarah, I can’t thank you enough for sharing part of the behind the scenes birth of your book baby. May the ‘Sinking’ launch at De Vere’s Irish Pub in Sacramento on the 27th be spectacular! Sarah ~ Thank you, Kathy for the interview and review! Sarah with other critique group members at the 2014 Amador Writers photo shoot. At 221 Baker Street West upstairs at Hein and Company Bookstore for the 2015 annual critique group photo shoot. Sarah in character for a Sherlockian afternoon of writerly fun surrounded by bookshelves everywhere. I wonder if she’s plotting her next trilogy? What I would say to future writers is to never give up. There will be great days and then crappy days, but each day make you stronger as a person and a writer. If you give up too soon then you will never know what could of been. Nothing happens over night. You can like Sarah’s author page on Facebook! Follow Sarah’s Blog Tour at the following link! On a recent road trip to the Lake Tahoe area of California and Nevada for a snow photo shoot, I prayed before going for eyes to see what I am so familiar with in a new way, and ears to listen to God’s still, small voice more than my own. My husband did the driving so I was free to pay attention to the surrounding beauty and majesty of the snow-capped mountains, frozen-over lakes, and hidden niches along our roadside journey. We begin our travels in prayer and I’d received several prayer requests to cover before leaving town. We intended to be on the road by 7 am, but didn’t hit the highway until 9. I needed the quiet, I longed for it. From the beginning, I was struck by the change once we got out of the bustle of Amador County into the higher altitude above 4,000 feet. Joe drove past one favorite spot after another where autumn had fluttered the season before ~ quaking aspen leaves danced the last dance, amber-gold leaves fallen to the forest floor. A blanket of white spread out now, 5,000 to 6,000 to 7,000 to 8,000 feet on salted and plowed California Highway 88. It was hard to see past the dirty snow plowed high on both sides of the two-lane highway. I strained to see beyond the three to five foot high barriers, but we had to pull over when we came to a turn-out than wasn’t completely snowed-in. The patchy snow we’d left behind in the lower elevations now rolled out above and below, blanketing the meadows, hills, and mountains at Kirkwood Ski Resort, and the rock formations reaching skyward. I listened and bundled up when we stopped and stepped out in the crisp snap of 40 degree air. Skiers shouldering their equipment hurried past us to hit the slopes. Other than the excitement of their voices and hum of their vehicles pulling in and out of the parking lots, I heard only silence from God. Before leaving Kirkwood, I caught sight of a cabin heavy laden with layers and layers of snow pack. The deck, the stairway, the roof ~ all covered. A narrow pathway had been shoveled from the street to the bottom of the stairs and banked high on each side. I was mesmerized. Who could get in and out? I heard a still, small voice ~ I am with you, nothing can separate you from me. While Joe drove toward the highway 89 junction, I thought about my recent prayers. My mother draws closer to leaving this earth after eighteen years with Alzheimer’s. The silence between us after she lost language seven years ago has been deafening. Most of my prayers about my mom have no physical voice, like melting snow they dissolve from within. And yet He hears, and answers the cries from the deep places in my heart. At Carson Pass I asked Joe if he could park and let me walk back and photograph the river. I’d never shot there in the winter. After four years of drought, seeing water flow from rain and snow melt was a moving experience. The rocks cried out, the land bore witness, the clear blue sky offered hope. In those moments, I trembled in awe. Once quenched, now revived. The beauty of His holiness. The glory of His grace. The truth of His presence. Prayers without ceasing ~ praises in worship. In the stillness of this place, in the silence surrounding me without and filling me within ~ He hears. The ache of loss, the sorrow He knows hurts, He carries for me in the midst of it all. In that surrender, peace that surpasses human understanding flows though me. He fills me in a way no other can. I hear Him call me by name. Joy. Images create a visual for the mind to focus in on and add a deeper dimension to thoughts and words. My drought-ridden state is being showered with rain and heavy snowfall after four long years of intense, dry heat. To say we are receiving an unmerited blessing isn’t enough. My heart is grateful that I am enjoying cozy, crackling fires contained in my home brick fireplace instead of news that blazes are burning from the northern forest of California to the southern hills. This new year is bringing change, renewal, a reviving spirit, and hope. My heart races with the passing clouds in anticipation for what is yet to come. I have choices to make about the direction I desire to go. Kathy the novelist is writing/traveling from the Cornish coast of England to the capital city of Sacramento, California. Kathy the photographer is shooting photo essays in the Sierra Nevada mountains, and Amador county, my own backyard. Kathy the prayer warrior continues to pray without ceasing with my prayer partner in Uganda, Africa, and fellow warriors that gather in my living room. There is lush fresh growth springing up from the dewy earth where barren, parched hard pan soil previously lay ~ brown and lifeless. Like a field of sprouting clover, this season offers rejuvenation. Let the Son break through and renew the prayers of my heart, the words of my mouth, and my commitment to persevere. Saturday, September 20th I will be speaking from 9 am – 11:30 am about Pinterest at the Inspire Christian Writers Workshop at Peace Lutheran Ministries, 924 San Juan Road, Sacramento, California. More specifically about how to build Pinterest boards to draw attention to your books, both published and pre-published. If you haven’t already discovered the picture wonderland of Pinterest; come, see, learn, build, and join those already pinning. Board pinning is a fun, relaxing, and creative way to draw an international audience in to get to know you as a writer/author and fellow pinner, while you work on your platform. Bring your computer, iPad, cell, or a notepad. You need not be a techie geek to master the visual world of Pinterest. If you can write a book, you can pin boards to tell as much of your story you want to reveal. I will touch on other social media you can use in conjunction with Pinterest. Author Kathryn Mattingly will also be speaking about social media including ~ Facebook. Twitter, and Linkedin. My mother now lives in the downstairs memory care section of the home where my Nana spent the last three years of her life. When Nana was upstairs in the assisted living residential area, one of my former CBS, Community Bible Study, teacher colleagues moved not far down the hall. Kyoko acknowledged me when I’d hug her and said hello then, but she didn’t chat much if I stopped by. She always had a warm smile and responded politely and respectfully. She still had a sweet-nature and was soft-spoken. I think sometimes she remembered me, and sometimes she simply didn’t. After Nana went home to heaven, I only revisited the home a couple of times. I intended to go back and check on Kyoko, but the demands of daily life and the out-of-town commute soon ebbed away at my best intentions. When my mom went to live there a year ago, Kyoko had transferred downstairs and was my mother’s next-door neighbor for the first few months before mom got her own permanent room. Most of the memory care residents spend their time in the large community room connected to the dining area. My mom doesn’t know me or any of my sisters anymore. Shannon, my second youngest sister and mom’s former caregiver, visits mom daily and feeds her one meal, usually dinner on the weekdays on her way home from work, and lunch on the weekends. Kyoko is always there too. Most of my six sisters have come to know her and her gentle ways. She likes to be close to my mother, and she’ll point you to the chair next to mom and bow until you take it. Many days when I make the commute to visit my mom is sound asleep when I arrive and she’ll doze for hours. It is such a disappointment for me not to catch her awake and alert. She still shows a flicker of a second of recognition, a smile flashes across her sweet face and then she’ll grab for my hand. But when slumbering, mom sleeps deeply. Kyoko is usually sitting on the nearby sofa and she’ll get up, walk over to me and it almost seems like she wants to speak specifically, as a comforting gesture like she can sense the depth of my heartache. Back when we served together at CBS, we were both core leaders of groups with about fifteen women. One year I was also the secretary and another year I was the Prayer Chairman so our time was interwoven in a variety of additional ways. Kyoko T. was dearly loved by her ladies. She knew God’s word intimately and she lived the grace and beauty of the Lord in every aspect of her petite being. We used to sing together in the leadership meeting circle these beautiful songs of praise and worship and sisterhood. Sometimes we sat next to each other and raised our quiet voices in harmony with fellow CBS sisters gifted with lovely songbird perfectly pitched, and choir worthy cadence. We also prayed together. That was my closest connection with this humble woman. We shared prayer requests and praises both within the leadership circle and outside of it. She knew all of my sisters names and my mother’s name, Mary. How faithful Kyoko was to remember to ask me about my family, my children, and my husband after a season of intercession. She shared about her home and the longings in her soul. Those were precious days of special friendship within a circle of women that you often only experience once in a lifetime. I eventually moved out-of-town and sent Christmas cards which eventually dwindled down over the next decade. Kyoko’s tender heart remains despite the loss of the memories of herself, her childhood, her family, her country, me and all her other CBS sisters. A loving Father placed her in her current home where she unknowingly continues to be a blessing to my mother and all those around her. I watch the gentlemen and ladies respond to her meek compliance and kindnesses. Her outer image is much altered, but her inner-Christ light shines with a brilliance like a star illuminating a night sky. I often sing to my mom if she is awake or to Kyoko if my mom is sleeping. Kyoko and I used to hold hands when we sang The Servant Song together in our CBS days. The lyrics hold a much deeper meaning to me now than almost twenty years ago. Kyoko remains a servant-hearted handmaiden of the Lord right where she is. There is hope where there is love. This year we celebrated Father’s Day a little different than the traditional norm. My middle son called Friday afternoon on his lunch break at work to see if he could drive up with his almost-three-year-old son the day before Father’s Day. A change in plans at home meant his wife would be helping a friend with their wedding preparations. We immediately said yes and rescheduled our not-so-set-in-stone plans. I threw together a low-key barbeque menu of ~ hamburgers, our son would provide the meat. My daughter just happened to have made a potato salad that morning. I went with store bought coconut cream pie and chocolate ice cream instead of the usual baked from scratch dessert. When the two other Joeys arrived, the littlest one was ready for an adventure. He loves the drive out in the country to our home and by the time he is set free from the confines of his car seat, he is bursting with energy to burn. Our black Lab greeted them at the front door with such enthusiasm, father and son could barely enter. There was a brief petting fest before they advanced to doggie number two ~ the elderly Rottie/Shepherd. “My Jakie, my Missy, I’m here!” Joey promptly helped grandpa feed the dogs their dinner. This was a very big deal, scooping kibble out of the giant bin, dropping the nuggets while listening to the tinkling sound as their shiny metal bowls filled up, and then watching them devour supper without leaving a single morel. Grandpa Joe went out to the back patio to turn on the propane and the littlest Joey followed, so did the big dogs.They have learned the BBQ means heavenly smells wafting at snout level and sizzling meats of all sorts flipped on the grill may fall to the ground, right into their pouncing paws. They have a strict one second gravity rule. If meat obeys their secret code call, and lands, it’s then an instant canine protein meal. Some olive oil spilled, This was a disappointment to the dogs, but not to my grandson. He got to use the hose and nozzle to spray down the cement patio, grandpa’s shoes, shorts and shirt, the sunshade, the wicker chairs, and he was aiming for the table when he was redirected out into the yard. He then requested the nozzle be adjusted to the long-range stream setting. He washed our windows and watered the yard. Such a thoughtful Father’s Day gift for his grandpa. Meanwhile his dad made a run to the market a few blocks away to buy the meat. I set the table and put out some chips and dip for snacking. When my son returned he seasoned the hamburger and flattened out large-sized patties for the buns. Jenny and I relaxed with the guys while the meat cooked. The dogs stretched out at the foot of the barbeque on voluntary guard dog duty. We all gathered around the table and my husband prayed a blessing. We then chatted about just about everything ~ jobs, summer vacation, retirements, how juicy the burgers were, gluten-free BBQ sauce without high-frutose corn syrup, Buzz Lightyear and how Joey could find Woody on his plate if he sopped up the catsup with his bun. Just family chit-chat. 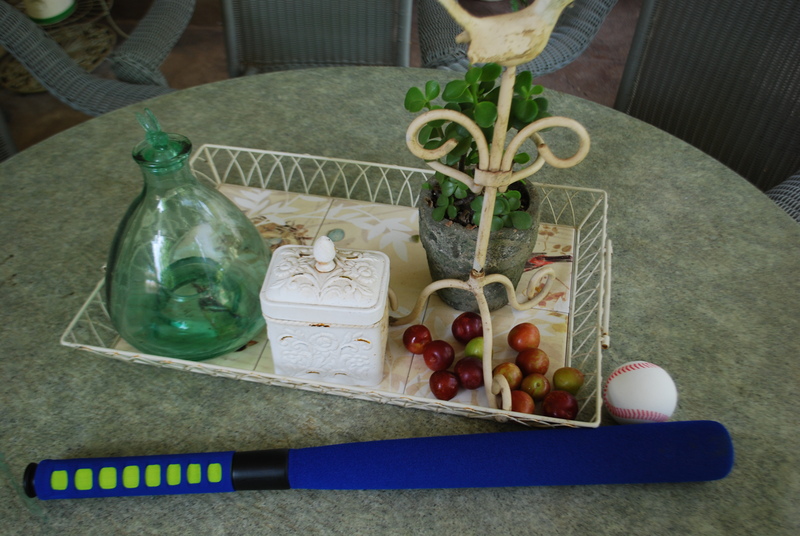 After dinner my grandson discovered the bright blue, soft cover baseball and bat set I got for his dad. The three Joeys found some dry grass and played ball. They took turns pitching, catching and batting. Ah the simple joy of an impromptu baseball game. It didn’t take our Lab Jake long to figure out that he could play outfield so he positioned himself and waited, He ran infield a couple of times to throw his body into the trajectory of the ball, and came so close, his jaws wide open like a leather glove. I have to tell you that my grandson has quite an arm. Not that I’m bragging or anything. We were about to retire inside when I noticed little Joey standing under the plum tree, his back to the rest of us, diligently and ever so quieting picking plums off a low lying branch. One plum went in his right jeans pocket, and one went in his left pocket. Pick, load, and pluck again. Most of the plums are still green, some a red, but several are a ripe squishy purple. Well that industrious fella turned around with an impish grin like he was wearing a double-holster with two six-shooters. He was relieved of his ammunition just in time for dessert. I guess a banana pudding cup and a bowl of chocolate ice cream top contraband with pits. After a diaper change and little Joey hugs and kisses, they drove off into the sunset. It was not by any means an extravagant adventure. It was ~ family play time, meal time, smile and laugh time, talk and share time, and we got to babysit for a while time. It was ~ perfect. Only one purple plum burst in Joey’s pocket. And that is what memories are made of. Gathered together to learn a new thing or two. An ocean full of memories my heart longs to save. I find myself writing words like seashells and sand, beach and breakers, shipmates and clams. Ships and anchors, horizon and whales, seals and otters, tugboats and sails. Writing a short story about blue fish with translucent fins.